Transformer oil is generally mixed with gas, water and contaminants. The content of the contaminants generally increases with time. In the oil treatment plants, these associated gases, water and contaminants are separated from the oil and taken away. In transformer applications, it is electrically critical that the oil does not contain too much of these substances. After treating the oil in the oil treatment plant, the stabilized oil is then again ready to be used in power transformers. Series ZYD Double-stage vacuum transformer oil purifier can remove the water, gas and impurities in insulation oil high-efficiently, increasing the pressure force and quality of oil, make the oil limiting voltage-withstand value much higher and make sure the electric device running safely. 1. This machine is high effective and portable, which is very suit to operate on line. 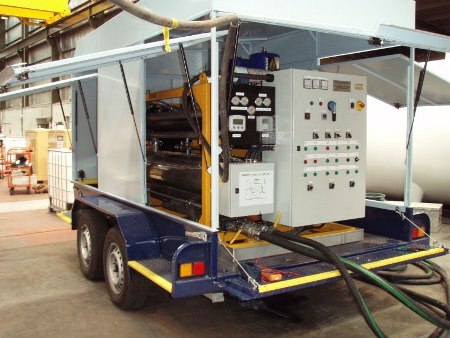 Also it can be used to dry the electric equipment and input the oil into the electric equipment under the vacuum state. 2.The machine adopts the double-infrared liquid automatic controller, sensitive automatic pressure protector and the high effective equipment for degas, so it is easy to operate. 6. UK G technology by which the trace water that is show chain, such as dissolved water, can be removed effect. 7. Distinctive removing impurities technology filtering through double FH trapezoidal network and absorbing by high polymer without the mechanical power. 8. Carbon fiber infrared heating system that can make the oil contains zero sum of ethyne after treatment. 10. Operational can be P.L.C (Programmable Logic Controller). ZYD-A Series Oil Regeneration System is combined Series ZYD with P.L.C system, making the whole operation 100% automatically. Comparing with the single-stage vacuum oil purifier, series ZYD adds ROOTS vacuum system, second stage of separating system to improve the effect of purification which dewaters, degases and removes impurities more quickly, more completely and make the oils limiting voltage-withstand value much higher. This machine also can remove free, soluble water, carbon, free and dissolved gases and particulate matters from insulating oil effectively and rapidly. As the bridge-type vacuum linking system that can filter and be an independent vacuum power supply, this machine can be vacuum treating the electric insulating devices. Series ZYD utilizes coacervation technology, coalescing technology, separating technology and refined purification technology.